“The human form is arguably the most difficult subject for an artist to render,” writes author and experienced art model, Andrew Cahner. “A landscape drawn a little inaccurately will still look like a landscape, but an error in depicting a human likeness will not look right.” Capturing an emotional quality is even more challenging, writes Cahner, adding that mastering figure drawing skills prepares artists to draw all other subjects with ease. Given the importance of live models to this endeavor, it is strange that so little attention has been paid to their training and that few resources exist to orient art school faculty, art model coordinators, and artists themselves. 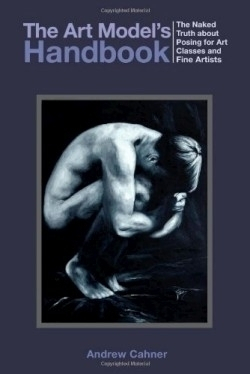 Cahner, an experienced professional art model, has ably filled the gap with The Art Model’s Handbook; going beyond basic modeling and drawing terminology and technique, he describes how the model is an active participant in the creative process of figurative artists, providing not just a visual reference, but also serving as a source of inspiration. Recognizing that, especially in American culture, body issues can deter potentially great models from ever pursuing the career, Cahner explains the difference between fashion modeling, with its need for models whose bodies share a particular idealized form, and art modeling, which requires people of all sizes, shapes, ages, and races. With sensitivity and skill, the author describes what the figure drawing experience is like for both models and artists, and establishes the parameters of mutual respect and concern that must exist between them. He also deals with most of the awkward or unfortunate situations that might cause a model distress, or even put him or her in danger, and offers guidance on precautions that would minimize discomfort and risk.